1 Bedroom Flat For Sale in Stockton-on-Tees for Asking Price £110,000. This lovely apartment has recently been updated, and now offers a very generous living room, contemporary kitchen, double bedroom and 'wet room' style shower room. The lounge features floor to ceiling windows to the rear overlooking the attractive communal gardens, with views beyond towards the Cleveland hills. With a single garage in a block to the side and parking to the front. Double glazed entrance door leads into the hall which offers access into the shower room and living room. Laminate floor, coving and ceiling light. 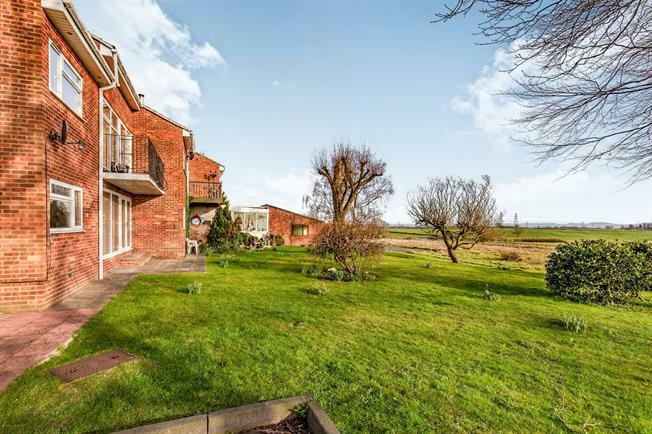 A fantastic size room, with double doors and two floor to ceiling windows making the most of the spectacular views of the communal gardens and open countryside beyond. Wall and ceiling lights, ornate coving and electric heaters. Large storage cupboard. Spacious and light, with a window to the front. Fitted with a good range of cream wall and base units with wood effect work surfaces. Plenty of room for dining table and chairs. Integrated oven and hob. Space for fridge freezer and washing machine. Tiled floor, ceiling light and electric heater. Window to the rear with delightful views. Range of fitted wardrobes, bedside tables, cupboards and overhead storage. Wall and ceiling lights, coving and electric heater. Designed as a wet room, with walk in shower cubicle, wall mounted wash hand basin and WC. Wall mounted heated towel rail and extractor fan. Built in double storage cupboard housing the hot water tank. Frosted window to the front. The living room opens out onto a private patio area. The pretty south facing shared garden to the rear is laid to lawn and features several mature trees and shrubs. Beyond the boundary is a wonderful view over farmland to the Cleveland hills. Located at the side of the apartment, with an up and over door to the front. Parking is available in a pay to the front.